The City of Leduc 2012 Downtown Master Plan (DMP) is a comprehensive long-range plan for revitalizing Downtown Leduc. It addresses key economic, environmental, and social issues for a comprehensive approach for revitalizing our City’s Downtown over time. The DMP contains an in depth urban design plan, design guidelines, as well as policies and implementation projects to support a vibrant and sustainable downtown area. Drafting the Downtown Master Plan has involved collaboration with numerous Downtown stakeholders and a high level of support from the Leduc Downtown Business Association (DBA). To help inform the DMP’s policies and objectives, numerous stakeholder discussions and events have been held to capture and support our community's vision for downtown Leduc. Leduc’s DMP is all about making small changes that will collectively create major improvements over the short, medium, and long term. Since approval of the plan, the city has been leading and collaborating on a number of DMP implementation projects. Check back here often for updates! The Main Street Streetscape Improvement Project is based on extensive engagement with downtown stakeholders that included public open houses and workshops during the development of the Downtown Master Plan, as well as detailed input at several Downtown Business Association meetings. Our revitalized downtown is almost complete! All concrete and asphalt work has been completed. There are a few repairs to be made (minor cracking and ponding), and you can expect these to be completed in Spring 2017 as part of the contractor's warranty period. Replacing the remaining streetlights west of 51 St. 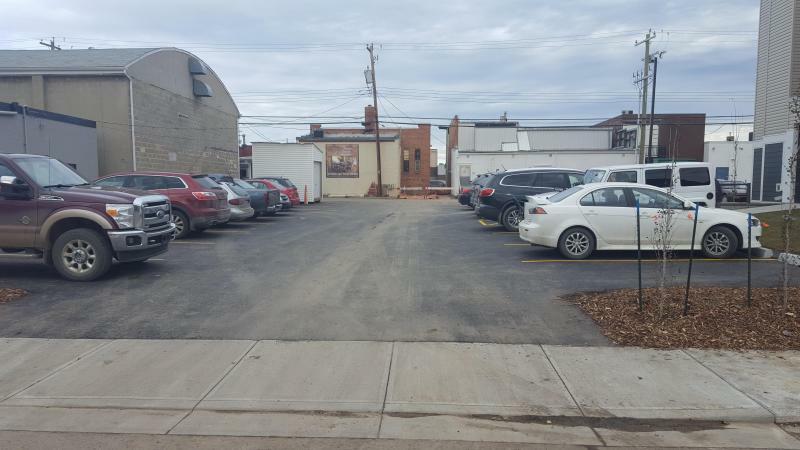 While some parking stalls have been relocated, we've added 19 new stalls to the downtown inventory in these 2 new parking lots. 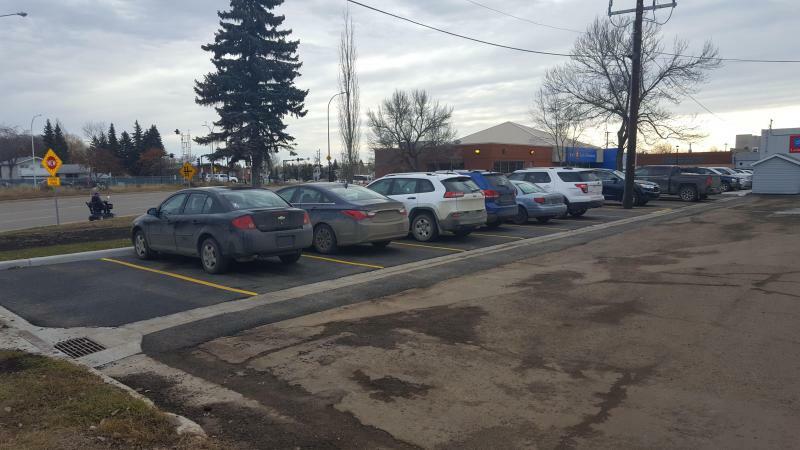 A new 15-stall parking lot next to Gaetz Landing (49 Ave. between 47 and 48 St.). There are 13 new public parking spots on 51 Ave., just north of the Bank of Montreal building. Contact the City of Leduc's Engineering Department at 780-980-7107 for any questions regarding this construction project. The community identified the documentation of historically significant buildings in the city’s downtown area as one of twelve priority tasks within the Downtown Master Plan. The Downtown Heritage Inventory is the fulfillment of this goal. This document will help guide future development in the downtown core and augment other objectives and undertakings identified in the Plan. The records within the inventory have been created for select buildings in the downtown core that have an evident historical character or presence still apparent today. This program provides opportunities for Main Street businesses to construct seasonal patios on the public sidewalk or within the roadway parking area in front of their businesses. Subject to an application approval, Main Street area businesses can set up an outdoor patio between May 1 - September 30 each year. To be approved for the on-street parking patio option, concrete planters are required around the outer perimeter of the patio area. As part of its limited-time incentive plan, the city will loan planters to businesses at no cost. The planters are made of heavy-duty concrete and act both as a safety barrier and as a downtown beautification element. The City of Leduc has been collaborating with the Leduc Farmers’ Market and Downtown Business Association to host the Leduc Farmers’ Market in the heart of the Downtown. The initiative has proven to bring more vibrancy, shoppers and visitors to the Downtown area, while offering a fun family-oriented outdoor destination for the community to gather and enjoy together. In 2014, the Downtown Farmers’ Market was hosted on Main Street as a pilot project, and was widely hailed as a success. This year, the Market is being hosted at the downtown City parking behind ATB, in order to support upcoming summer construction activities on Main Street and 46/47 Street intersection. Assist Downtown commercial property owners and businesses with improvements to their exterior storefronts to create a more vibrant and attractive Downtown area. 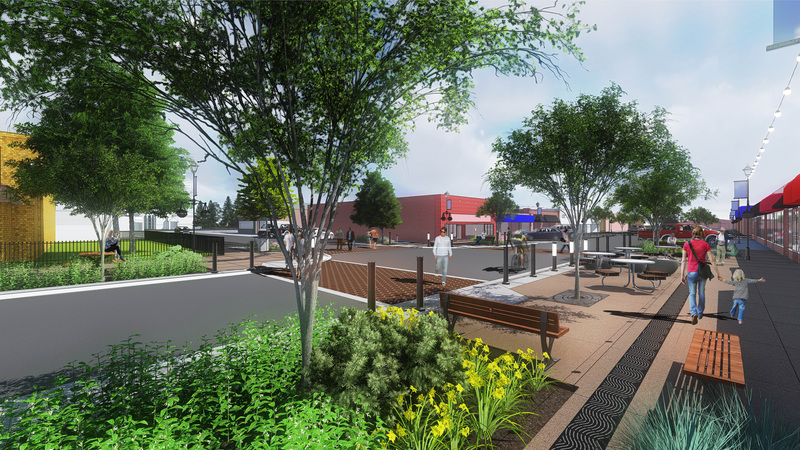 Help create an attractive image of the downtown that reflects Leduc’s culture and heritage, and aligns with the policies and intent of the Downtown Master Plan. Restore and compliment historic features of building storefronts, including properties found in the Downtown Commercial Heritage Inventory. Encourage consistency in our downtown’s overall built form, while recognizing the importance of encouraging diversity and individual characteristics of buildings. For more information on any of the projects listed above, call 780-980-7177 or email info@leduc.ca.